A Louisiana liquor store manager was as cool as a cucumber during a burglary event — even when two suspects stuck a gun in her face. According to a report by KTBS-TV, the incident took place at a family-owned liquor store Monday night in Cullen, Louisiana. Sahim Hassan was working during the incident, which took place around 10 p.m. local time, when two suspects barged into the store and put a gun in her face. Hassan stood stock still with her hands on her hips and began approaching the armed suspect, who had a bandanna obscuring most of his face. “If you’re gonna kill me, I want to see your face,” Hassan told the suspect according to employee Lindsey Ward — who spoke with Blue Lives Matter — and began yanking the suspect’s bandanna off his face. The armed suspect reportedly then commanded the other suspect to take the cash out of the register. Hassan, who was still near the armed suspect, turned her back and walked toward the second suspect, shoving him aside while she went behind the counter to grab her own handgun. “I’ve got something for you,” Hassan said, according to Ward. 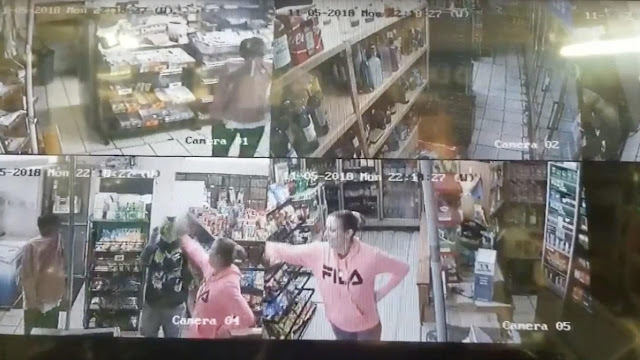 Ward grabbed her .45-caliber pistol as the two suspects scrambled to leave the store — empty-handed — but not before the armed suspect fired a round, striking Hassan in the leg. Not even a bullet could stop Hassan at this point — and she returned fire, striking one of the suspects in the shoulder. She continued firing another three rounds as the suspects reportedly fled on foot. Ward reported that police apprehended the two suspects, both reportedly from out of the area. A spokesperson for the Cullen Police Department told Blue Lives Matter that the incident is still under investigation and would not provide any further details at the time of this writing. Cullen Police Chief Rosette Harris said that in her two years as chief, it’s the first armed robbery that she’s had to investigate. KTBS reported that Hassan was transported to a hospital in Shreveport for treatment of her injury. She is expected to make a full recovery. Blue Lives Matter obtained surveillance footage of the incident, which showed Hassan completely unfazed during the burglary. some women have balls ! This savage behavior by blacks is why they were lynched, contrary to the liberal lies of them being killed “merely for being black”.